For International Women’s Day, Hidesign promotes “Be Prepared. Be Fearless.” encouraging women to be their free, fearless and independent selves. 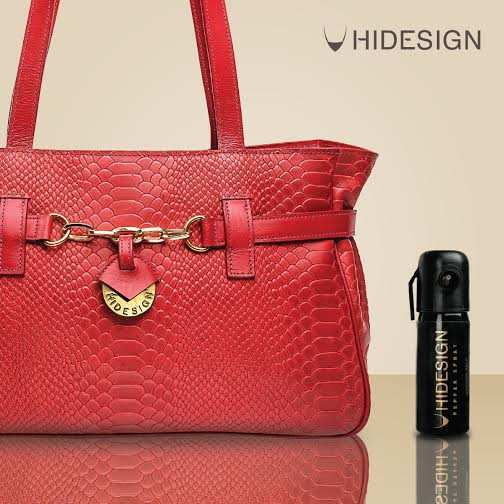 With every purchase of a Hidesign bag you receive a Pepper Spray - a handbag essential along with your wallet, mobile, make up, sunglasses and keys. Our women customers juggle multiple roles - a caring mother, a loving wife, an entrepreneur, a national sports star or even a prominent politician - and do it with grace and confidence. From a power meeting to a night out, from languorous Sunday brunches to casual evening walks, Hidesign is proud to have been a constant companion to women. The brand supports equality and has been a strong advocate of women and their rights – well demonstrated by the number of leadership roles held by women in the company. At Hidesign, women are our Heroes. Available at exclusive Hidesign stores across India between 4th March and 21st March 2015.